I should warn you, art has never really been my thing. I have never felt comfortable contemplating art pieces, analyzing them or describing what I feel when I look at them — partly because I feel nothing. As you might imagine, then, attending the Abu Dhabi Talking Art Series was a novel experience for me. The Talking Art Series is an ongoing series of discussions — usually conducted under different contexts and diverse methods of presentation — that examine the development of museums and cultural life in Abu Dhabi, Al Ain and the future of the Saadiyat Cultural District. Organized by Abu Dhabi Tourism & Culture Authority, Agency France-Muséums and the École du Louvre, the Talking Art Series, was introduced in 2011. 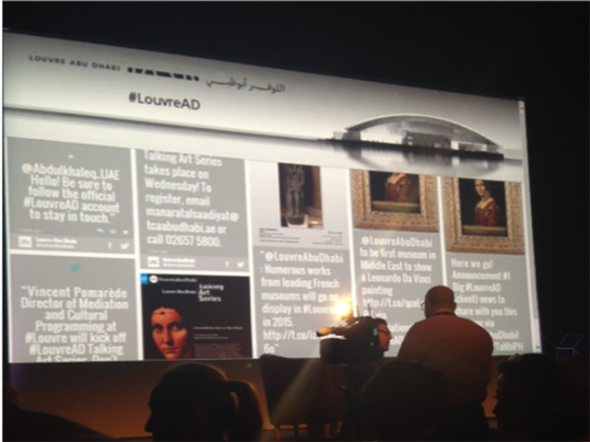 The panel discussions are leading towards the opening of the Louvre Abu Dhabi, slated for November 2015. The series examines some of the ideas that go into creating a museum collection, such as universality, discovery, education, cross-cultural engagement, rituals, faith and religion, issues that the museum also includes in its mission statement. Exhibitions and discussions are organized with the idea of raising the awareness of people on such issues. The collection will explore the aesthetic beauty of ancient and contemporary art pieces created by artists from all over the world. The Louvre’s placement in Abu Dhabi specifically is significant as it is built in one of the most cosmopolitan and international cities in the Middle East. In a way, the museum will create a linkage between different cultures, an idea that was emphasized at the beginning of this panel. Vincent Pomarède, former Director of the Painting Department at the Louvre Museum in Paris and current Director of Mediation and Cultural Programming, spoke about some of these ideas. In very fast-paced French, he eloquently described the life and career of Leonardo da Vinci, along with a discussion of one of Da Vinci’s paintings, La Belle Ferronnière, which will be presented at the opening of the Louvre in 2015. The speaker dove into the history of Ferronnière, its placement in Abu Dhabi, and its significance as one of Da Vinci’s works, along with an explanation of the process of its restoration. What struck me as I listened was the discovery of how little I knew about Da Vinci. Pomarède defines Da Vinci as a sculptor, an architect, and an engineer, as well as many Renaissance qualities. He also explained that the intricate details of Da Vinci’s paintings exemplify the artist’s rich and versatile talents. Da Vinci is considered, by Pomarède (and perhaps a large portion of the art world), the embodiment of creativity, whose innovative artistic techniques signify that he was not easily intimidated by the possibility of failure. Pomarède even states that one of Da Vinci’s most famous works, The Last Supper, was considered a failure at the time. Though I’ll admit I had no idea that The Last Supper was even a piece by Da Vinci, what Pomarède mentioned so casually shocked me, given the modern view of the greatness of the piece and its representation of religion in a different and, to some people, spiritual way. Da Vinci is also famous for his realistic conveying of beautiful women in works such as the Portrait De Ginevra De’ Benci or the Portrait of Beatrice D’Este. This brings us to La Belle Ferronnière, the portrait of an unknown woman, with soft facial features and a beautiful design. In Pomarède’s words, the painting presents emotions and sensuality in Da Vinci’s unique yet realistic way. 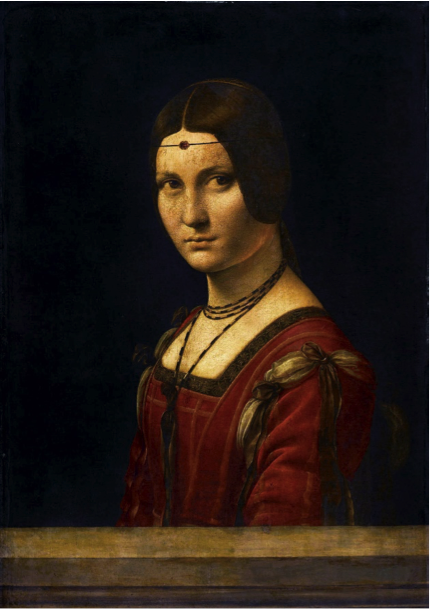 Pomarède hypothesized that the piece exemplifies details of Da Vinci’s personal life, perhaps inspired by the quest of his artistic self, in terms of how he wanted to create art and with what methods. Pomarède explained that art historians still do not understand the woman behind the painting, though they have (according to Pomarède) misinterpreted the artwork several times, trying to compare the woman to Da Vinci’s previous and future portraits but failing to find evidence that she is the same woman from any other portrait.